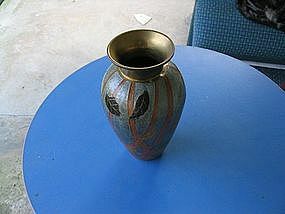 This vase is approximately 7 1/2" in height and has a nice weighty feel. I dislike light weight brass. I don't remember if it is solid brass, but I believe it is from India. There are no dents, however, there are some small areas of loss to the enameling. Additional condition photos by email. I need your zip code to calculate postage.